A discovery made at Duke-NUS Medical School (Duke-NUS) has been licensed to a newly launched Singapore-based company, Babynostics Pte Ltd. Babynostics plans to use the intellectual property (IP) derived from Duke-NUS research to develop diagnostics and nutritional products that encourage normal and healthy brain development in foetuses, and for pre-term infants, babies and children. 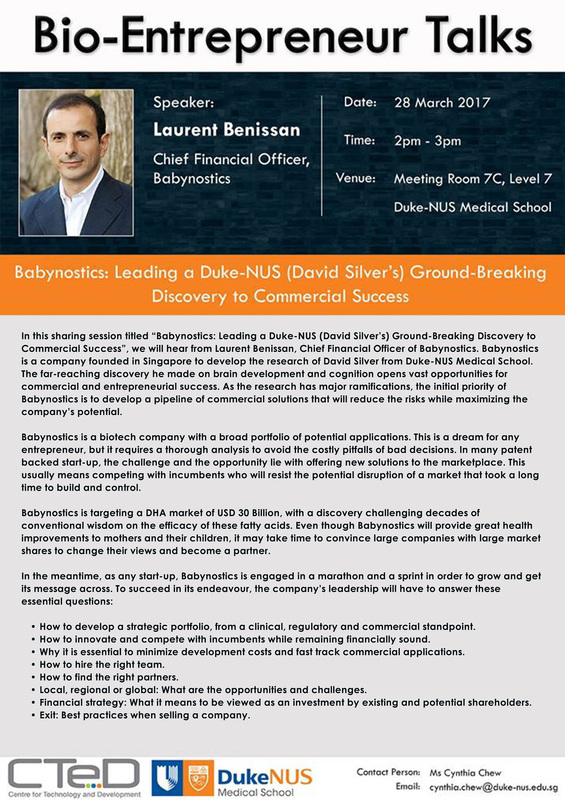 In this sharing session titled “Babynostics: Leading a Duke-NUS (David Silver’s) Ground-Breaking Discovery to Commercial Success”, we will hear from Laurent Benissan, Chief Financial Officer of Babynostics. 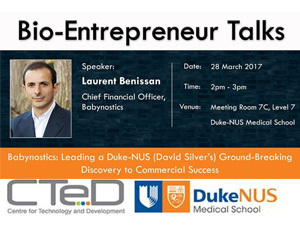 Babynostics is a company founded in Singapore to develop the research of David Silver from Duke-NUS Medical School. The far-reaching discovery he made on brain development and cognition opens vast opportunities for commercial and entrepreneurial success. 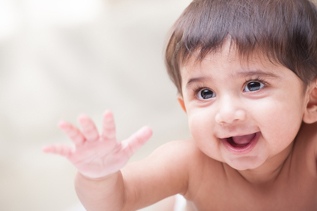 As the research has major ramifications, the initial priority of Babynostics is to develop a pipeline of commercial solutions that will reduce the risks while maximizing the company’s potential. Eye photoreceptor membrane discs in outer rod segments are highly enriched in the visual pigment rhodopsin and the ω-3 fatty acid docosahexaenoic acid (DHA). The eye acquires DHA from blood, but transporters for DHA uptake across the blood-retinal barrier or retinal pigment epithelium have not been identified. Mfsd2a is a newly described sodium-dependent lysophosphatidylcholine (LPC) symporter expressed at the blood-brain barrier that transports LPCs containing DHA and other long-chain fatty acids. 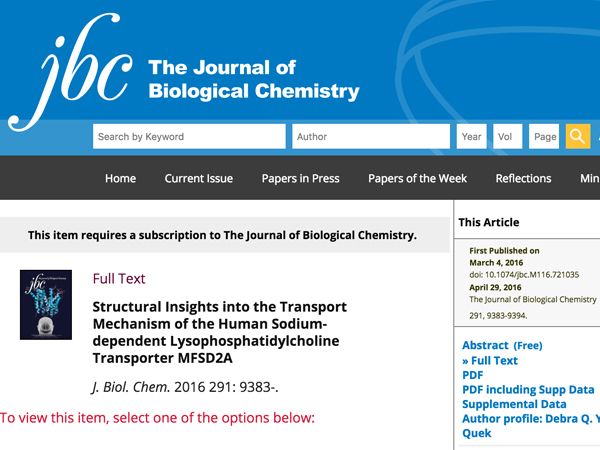 STRUCTURAL INSIGHTS INTO THE TRANSPORT MECHANISM OF THE HUMAN SODIUM-DEPENDENT LYSOPHOSPHATIDYLCHOLINE TRANSPORTER MFSD2A. Major facilitator superfamily domain containing 2A (MFSD2A) was recently characterized as a sodium-dependent lysophosphatidylcholine transporter expressed at the blood-brain barrier endothelium. It is the primary route for importation of docosohexaenoic acid and other long-chain fatty acids into fetal and adult brain and is essential for mouse and human brain growth and function. Remarkably, MFSD2A is the first identified major facilitator superfamily member that uniquely transports lipids, implying that MFSD2A harbors unique structural features and transport mechanism. 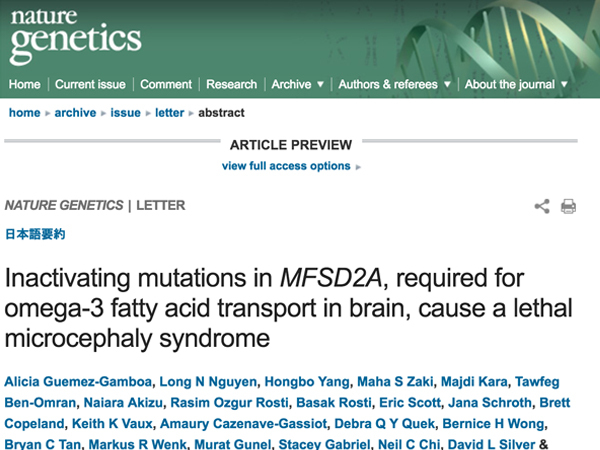 INACTIVATING MUTATIONS IN MFSD2A, REQUIRED FOR OMEGA-3 FATTY ACID TRANSPORT IN BRAIN, CAUSE A LETHAL MICROCEPHALY SYNDROME. Docosahexanoic acid (DHA) is the most abundant omega-3 fatty acid in brain, and, although it is considered essential, deficiency has not been linked to disease. Despite the large mass of DHA in phospholipids, the brain does not synthesize it. DHA is imported across the blood-brain barrier (BBB) through the major facilitator superfamily domain-containing 2a (MFSD2A) protein. MFSD2A transports DHA as well as other fatty acids in the form of lysophosphatidylcholine (LPC). 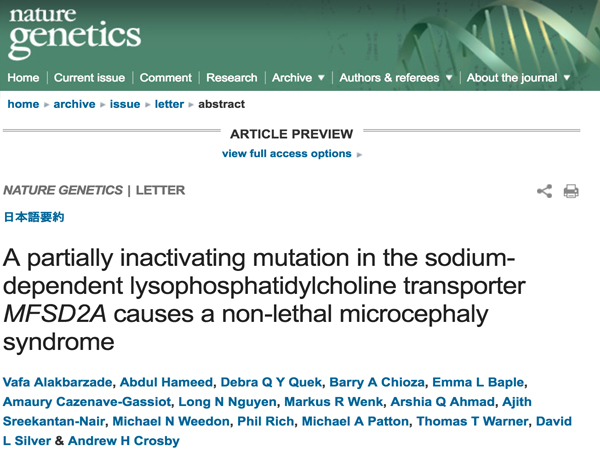 A PARTIALLY INACTIVATING MUTATION IN THE SODIUM-DEPENDENT LYSOPHOSPHATIDYLCHOLINE TRANSPORTER MFSD2A CAUSES A NON-LETHAL MICROCEPHALY SYNDROME. The major pathway by which the brain obtains essential omega-3 fatty acids from the circulation is through a sodium-dependent lysophosphatidylcholine (LPC) transporter (MFSD2A), expressed in the endothelium of the blood-brain barrier. Here we show that a homozygous mutation affecting a highly conserved MFSD2A residue (p.Ser339Leu) is associated with a progressive microcephaly syndrome characterized by intellectual disability, spasticity and absent speech. 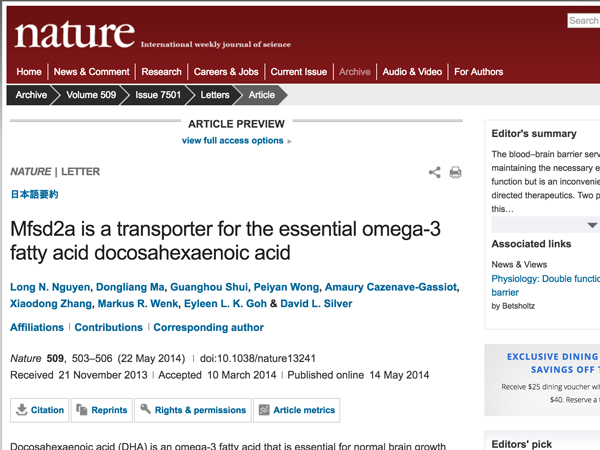 MFSD2A IS A TRANSPORTER FOR THE ESSENTIAL OMEGA-3 FATTY ACID DOCOSAHEXAENOIC ACID. Eye photoreceptor membrane discs in outer rod segments are highly enriched in the visual pigment rhodopsin and the ω-3 fatty acid docosahexaenoic acid (DHA). The eye acquires DHA from blood, but transporters for DHA uptake across the blood-retinal barrier or retinal pigment epithelium have not been identified. Mfsd2a is a newly described sodium-dependent lysophosphatidylcholine (LPC) symporter expressed at the blood-brain barrier that transports LPCs containing DHA and other long-chain fatty acids. 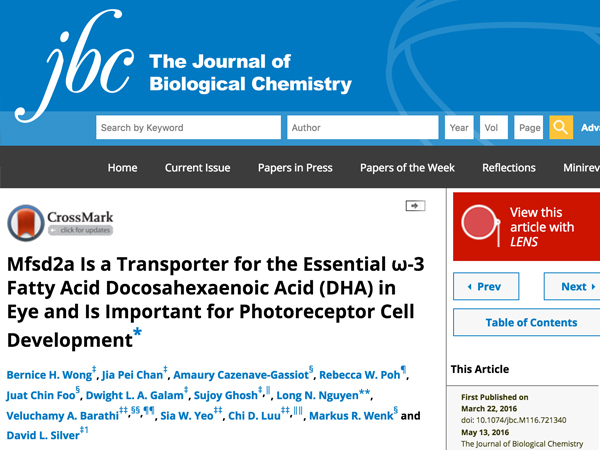 LPC transport via Mfsd2a has been shown to be necessary for human brain growth.